Mechanical engineering senior Chelsea Elizabeth Robinson and Taunya Phillips (BSCHE '87) were honored at the 28th annual Lyman T. Johnson Torch of Excellence Awards Dinner on Friday, Oct. 19, at the Woodford Reserve Club at Kroger Field. UK’s academic colleges and units select one African-American alum whose faith, hard work and determination has positively affected the lives of people on the UK campus, the city, state or nation. These individuals received the Lyman T. Johnson Torch of Excellence Award. 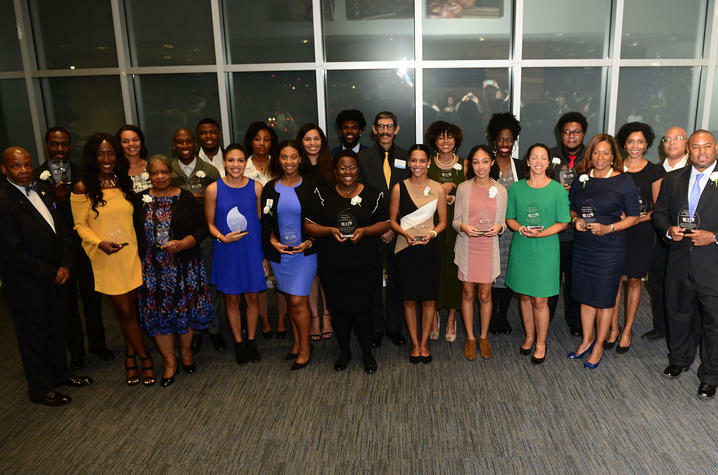 These units also choose an African-American student within their respective colleges/departments whose academic achievement and ability to impact the lives of others would warrant them to receive the Lyman T. Johnson Torch Bearer Award. Phillips received the Lyman T. Johnson Torch of Excellence Award and Robinson won the Lyman T. Johnson Torch Bearer Award. The awards ceremony was part of the 2018 Lyman T. Johnson Homecoming Celebration.